The two approaches to accessing external files on the local file system. Know how to work with files using the open file–close file model. Understand that there are different "modes" of the open file command, depending on what you plan to do with the file after you open it. Recognize that good programming practice demands that you always close a previously opened file when you are finished accessing it. Know how to work with files using the resource-oriented (URL) model. Understand how file permissions can limit what you can do with files, regardless of the access model you use. Often you may want to use data stored in external files in your LiveCode program. LiveCode has a rich set of tools that make reading, writing and modifying external files simple. This lesson will look at the basic tools and techniques for working with external files. There are two different approaches for reading and writing external files. One model is oriented toward local, disk-based files systems. The other is oriented toward a world connected by the internet. go to stack URL "http://dight210.byu.edu/Resources/InClass_Work/ExtFilesLect.rev"
Do the activity "Exploring the open and close commands". Under this model, before you do anything with a file it must be accessed, or formally "opened". The open file and close file commands perform the "housekeeping" functions that are necessary to adhere to the rules of the computer's file system, freeing the developer from that task. By default the open file command looks for the file or creates the file (if it doesn�t already exist) in the same folder as the LiveCode application. If another location is desired, the entire pathname must be specified. LiveCode uses Unix file path conventions, so the slash (/) character is used to delimit levels in the file path. Users of the Classic Mac OS therefore must get used to using a slash character instead of a colon to delimit levels, while Windows users must get used to using a slash rather than a backslash (\). Forgetting the key word file. open file for update - (Default form) opened file will be available for both reading and writing. open file for read - Opened file will be available for read only. You must use this form for opening files from read-only media (like CD-ROMs); if you try to use any other form the subsequent read access will fail. open file for write - Next write to file command will completely replace the files contents. open file for append - Next write to file command will add its data to the end of the file without replacing current contents. read from file ... until end|empty|EOF -- these are synonyms. All three will read until reaching the end of the file. read from file ... until string -- where string is any text string. Will read until encountering the string in the file. read from file ... at startPoint for amount -- where startPoint and amount are positive integers. Will read starting at startPoint for amount characters. read from file ... for amount words|items|lines -- where amount is a positive integer. Reads the specified number of chunks. No until or for parameter provided. Filename is different from opened file. write "Hello" to file "/MyHD/MyFolder/myFile.txt"
The write command must be preceded by either the open file for update, open file for write, or open file for append form of the open file command. Preceeding a write command with the open file for read form, for example, will cause the write command to fail, and the result function will return "File is not open for write." By default, writing starts where the last read or write command left off, assuming the file was not closed since the previous read or write. write...to file...at start -- where start is a positive or negative integer. For a positive number the write begins start characters after the beginning of the file; for a negative number the write begins start characters before the end of the file. If no start is specified, writing begins at the place the last read or write operation left off, or at the first character if this is the first read or write since the file was opened. write...to file...at EOF|end -- Starts writing after the last char in the file. Overwriting an existing file with new file of the same name. Using a filename that is different from opened file. Trying to write to a file not previously opened. The mid-1990s was a watershed period for personal computing. During this time the World Wide Web revolution started a paradigm shift in the way people worked with their computers. No longer were users limited to accessing only data on their local hard drives. Now, through the medium of a web browser they could access information on a huge, interconnected "web" of computers around the world. The internet became a huge presence almost overnight. The inventors of the Web needed a simple way to reliably retrieve different types of data on the literally millions of computers on the internet. They came up with the concept of the Uniform Resource Locator, or URL. This is most familiar to users of the Web as the "web site address" they enter into their browser's address field to go to a new web site—familiar addresses like www.ibm.com, byu.edu, www.nasa.gov, livecode.com, etc. These URLs often include file path and file name information in addition to the basic web site address. For example, an address like livecode.byu.edu/dight310/schedule.html tells us that the resource we want is on the web server livecode.byu.edu, in a folder named "dight310" and in a file named "schedule.html". What many Web users don't realize is that URLs can locate much more than "pages" on the internet. There are a number of URL schemes that specify the method or protocol for retrieving the resource you are trying to get. You see this in the http:// portion of the URL, which web browsers automatically provide if you do not type it before the address. HTTP, or Hypertext Transfer Protocol, is far and away the most commonly-used scheme on the internet. But you've probably noticed others, like https, Hypertext Transfer Protocol Secure; mailto, Email address; or ftp, File Transfer Protocol. There is even a scheme, called file, for accessing files on the local file system. Another thing many Web users don't realize is that any computer application, not just web browsers, can be written to access internet resources. Some common examples include email applications, like Microsoft's Outlook and Apple's Mac OS X Mail; iTunes, which connects directly to Apple's online music store; and the many applications that include a "Check for Updates" feature. binfile: a binary data file on the local disk. Use the binfile scheme to read in media files, such as an audio or image files, or files saved in text encodings that are different from your computer's native encoding, such as UTF-8. put URL "file:myfile.txt" into field "myfield"
You are not limited only to retrieving entire files. A URL can be considered a full-fledged LiveCode container, just like a field or variable. That means you can access chunks of data in a file using lines, characters, words, items, etc. put line 1 of URL "file:myfile.txt" into field "myfield"
put field "myfield" into URL "file:myfile.txt"
put return & line 1 of field "userName" after URL "file:userList.txt"
put it into item 5 of URL "file:myfile.txt"
put "Test" into word 3 of URL "file:/Users/Documents/Test.txt"
put field "myfield" into URL "file:myFolder/myfile.txt"
put field "myfield" into URL "file:/System/myfile.txt"
So far we have only discussed the file protocol for URLs. There are several others that LiveCode supports. Most of these we will cover in a later discussion. But let's look briefly at the binfile protocol. The binfile protocol is also used to access files on the local file system. The main difference between file and binfile is that the file protocol is intended for files containing platform-native ASCII text. The binfile protocol is for accessing files containing binary data—things like image or audio files, for example. When you use the file protocol to retrieve the contents of a file, it modifies the line ending characters to match the current operating system. If you don't know what this means, don't worry—we'll cover this in a future topic. For now it's sufficient to understand that you should use file for plain, platform-native ASCII text files, and binfile for everything else. Absolute paths have several inherent limitations. Most notably, if you create a program on one machine, the absolute paths will most likely be different on another one (due to different folder names, different user logins, different platforms, and so forth). But LiveCode provides tools for adapting absolute file paths to the current host system. Most common operating systems have standard folders for storing certain types of information. For example, preference files tend to be stored in a specific place; each user has a "home" folder where they can save their files; and there are typical places for storing temporary files. As a cross-platform development tool, LiveCode gives you an easy way to find out where these folders are located on the current host operating system, a function called specialFolderPath(). The specialFolderPath() function returns a file path to the folder appropriate for the current operating system. For example, on Mac OS X specialFolderPath("desktop") might return something like "/Users/myname/Desktop". On Windows it might be something like "C:/Users/myname/Desktop". There are several common folder identifiers you can plug in to this function, including "home", "preferences", "temporary", and "fonts". Each identifier returns the platform-specific path to the given folder. See the LiveCode dictionary entry for specialFolderPath for a complete list. One particularly useful folder identifier is "resources". When you call specialFolderPath("resources") you get the file path to the folder your stack is saved in. That makes it simple to build file paths to media assets that are stored in the same folder as your stack. A note about special folder paths on mobile platforms. The specialFolderPath() function works on iOS and Android, but because file system access is much different on mobile versus desktop platforms, the available folder identifiers for mobile platforms are different, too. Perhaps the most useful folder identifiers for mobile devices are engine, documents, and cache. The resources identifier is also useful in the mobile environment; it is a synonym for engine. specialFolderPath("engine") – returns the file path to the folder where your app is located in the mobile device's file system. This is most often where you would store media file resources like image and audio files for access by your app. specialFolderPath("resources") – same as "engine". specialFolderPath("documents") – returns the file path to the folder where your app is permitted to save permanent documents. specialFolderPath("cache") – returns the file path to the folder where your app can save temporary files. set the defaultFolder to "/MyHD/MyProject/textfiles"
Once the defaultFolder is set, any reference to a relative file path will begin at the specified default folder to derive the full file path. Setting the defaultFolder persists only until LiveCode is shut down, so if you want this folder to be used every time you open your stack, you should probably set the defaultFolder in an openStack or openCard handler. Several commands are provided that make it easy to choose a location for the file. They can be used in conjunction with the get/put URL method, or with open, read, write, and close commands. These commands are intended to present familiar open and save-style dialog boxes, consistent with the operating system you are using. syntax: answer file prompt where prompt is a text prompt that will appear in the dialog. 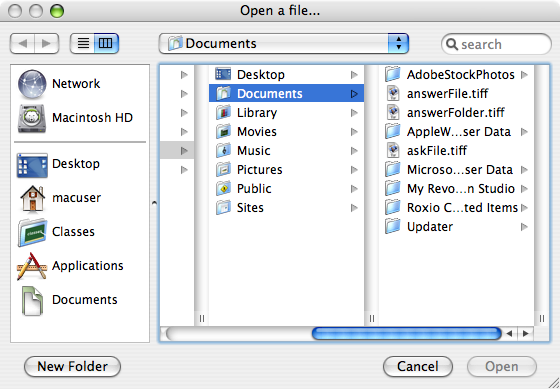 The answer file command brings up a standard file selection dialog, such as you see when choosing Open... from the File menu in most applications. When the user select the file, its full path name is returned to the special variable it. Keep in mind that answer file does not actually open the file, but only returns the name and path of the selected file. The actual opening and reading have to be scripted. answer file "Open a file..."
put url ("file:" & tFilePath) into fld "fileContents"
syntax: answer folder [prompt] where prompt is an optional text prompt that will appear in the dialog. The answer folder command brings up a standard Open dialog to let the user select a folder. The full pathname of the selected folder is returned in the it variable.This command can be used to let the user choose where a file is to be saved, or where to look for an existing file. answer folder "Where are your audio files located?" syntax: ask file prompt [with defaultFileName] where prompt is a text prompt that will appear in the dialog. If you specify a defaultFileName, that string will appear in the entry field for the file name, and the user can choose either to accept it or change it. 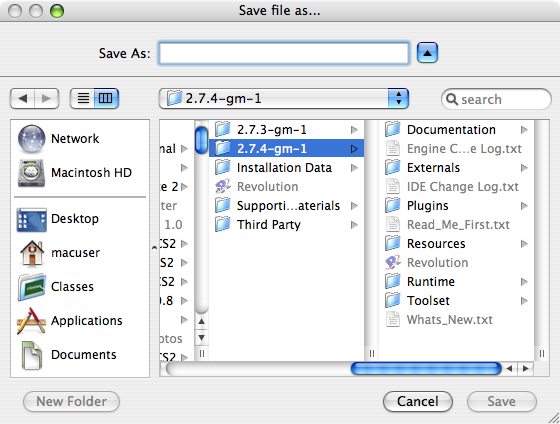 The ask file command brings up a standard file dialog, such as you see when choosing Save... from the File menu in most applications. It allows the user to type a file name and specify a location to save it,then puts the result into the special variable it. Remember that ask file does not actually create or write to a file, only returns a pathname and the name the user typed. The developer can use this information to actually write the data to the file in the location returned by this command. ask file "Save file as..."
The files function returns a list of files in the defaultFolder. about the file, such as its modification date, size, and access permissions. put the files into fld "myfld"
The folders function returns a list of folders in the defaultFolder. about the folder, such as its creation date and access permissions. put the folders into fld "myfld"